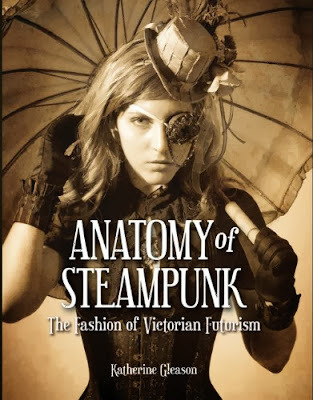 Arriving in late October, "Anatomy of Steampunk: The Fashion of Victorian Futurism" is by author Katherine Gleason, who has also written a fashion book on Alexander McQueen. The book is full of achingly beautiful images of steampunk fashion. Some of the designers profiled include Airship Isabella, Belladonna Belleville, Dawnamatrix, Lastwear, Steampunk Emma Goldman, and The Uprising of the Gin Rebellion. I am so excited to display this book on my coffee table! I'm sure after reading it I am going to find my closet full of perfectly nice gowns, suddenly boring and drab and dingy!